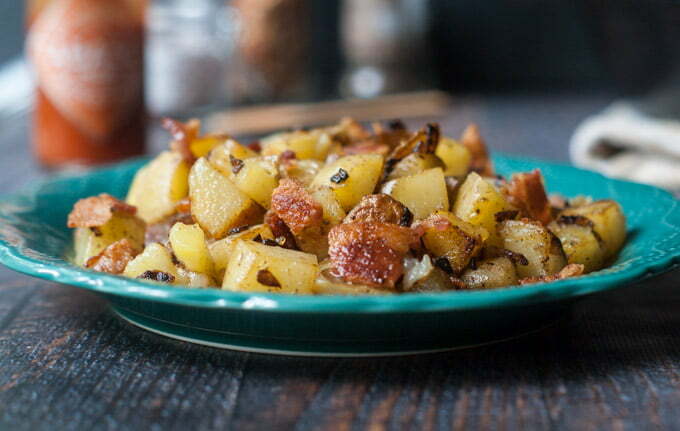 These German style fried potatoes are pure comfort food. So easy to make and sure to be a family favorite. This weeks theme at Sunday Supper is Oktoberfest. When I was younger, I never missed this celebration but it was mostly about beer, friends and having a good time. So I’m not up on German food too much. 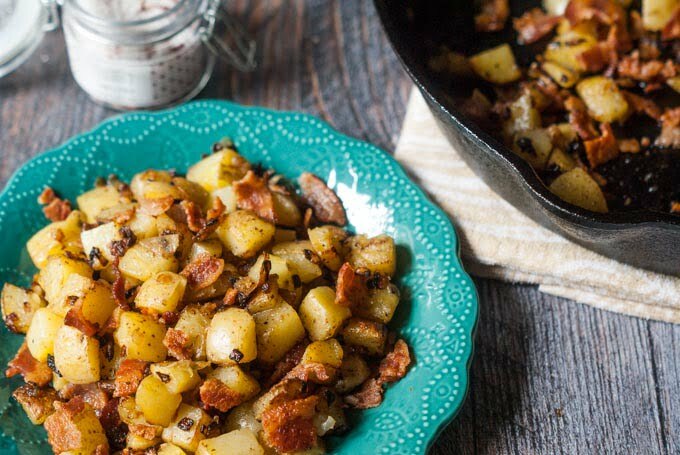 So while perusing recipes I came across Bratkartoffeln (please don’t ask me to pronounce it) which is German pan fried potatoes. I thought I can handle that especially as it involves bacon. So today I offer you my fried potatoes German style. It’s super easy and only takes 3 ingredients. It has bacon. Need I say more. Microwave your potatoes first to make them soft inside and crispy outside. Use a good thick bacon if you can. This is pure comfort food for me. I even ate a little with a fried egg for breakfast the next day. 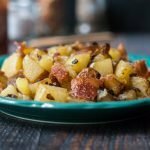 I hope you like these German fried potatoes and for more good German food scroll down to see what the Sunday Supper family has for you. Thanks for Cricket of Cricket’s Confections for hosting! 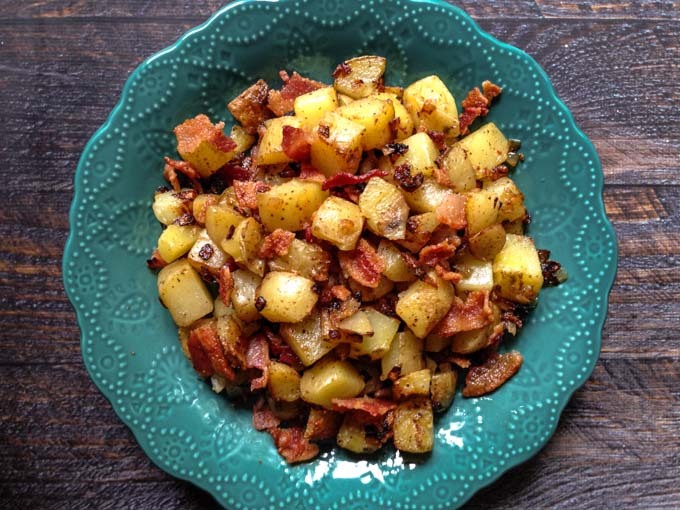 In a large skillet, add bacon and fry until crispy. At the same time, add your potato cubes to a microwaveable dish and microwave for 5 minutes. When the bacon is done, take it out of the pan and add the diced onion. 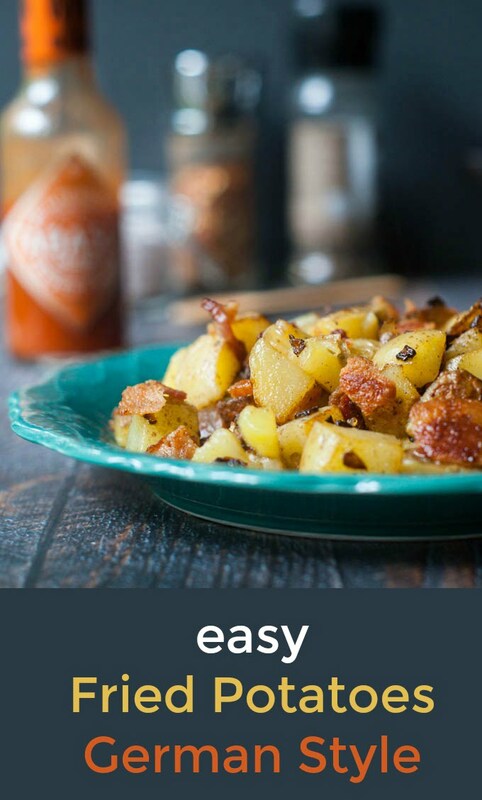 Saute for 1 minute and then add your potatoes. Cook for 15 minutes or more until the potatoes are cooked through. Add back crumbled bacon and mix through. 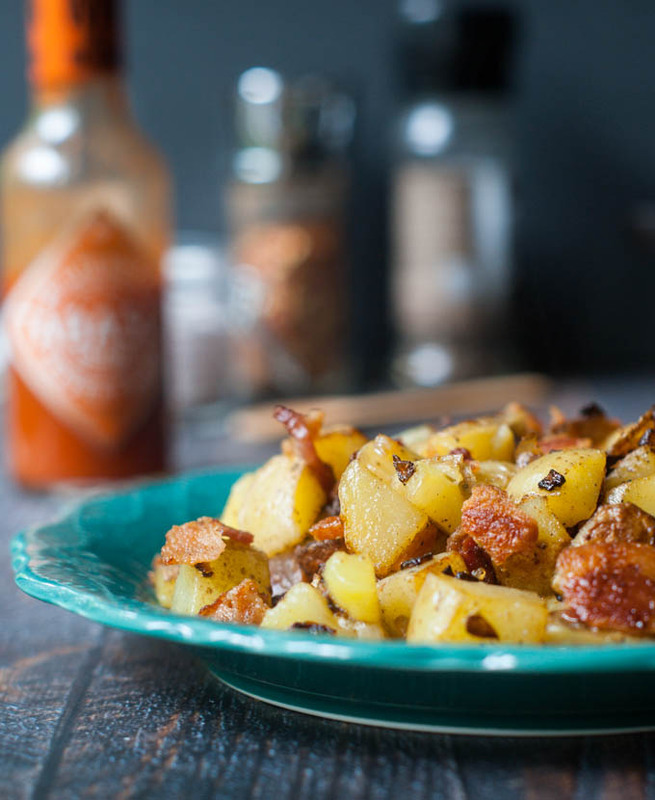 I fry potatoes like this all of the time but I’ve never thought to microwave them first! What a great idea! It really does help to microwave them first. Makes them nice and soft on the inside and then you can crisp them up on the outside. I’ve made these before but adding bacon would definitely take it up a notch! Roseann I could say that about a lot of things! We eat a lot of bacon in this house. I have lots of memories seeing these being cooked up in huge pans on the market either in Germany or at German Christmas markets in the UK – the smell is so tough to walk by! Yours look great. Thanks Caroline. You have so many great stories. I love hearing about them!